So here's my first foray into Arthurian anything for a very long time indeed. The Seeing Stone by Kevin Crossley-Holland and its sequels have had me transported right back to childhood holidays in Tintagel in Cornwall before it had gift shops.If you've been there in recent times you'll find it hard to believe it was ever like that but the place used to be empty back in the early 1960's. A ruined castle, one shop called Camelot Crafts, a pseudo round table exhibition and a stony beach called Merlin's Cove reached by Land Rover and that was it.But myth and legend have a huge impact when you are 10 years old and it was all memorable. I wasn't prepared to be quite as "spellbound" as Philip Pullman with The Seeing Stone because blurb hyperbole is starting to draw my attention lately and the book also had the pre-requisite word "Guardian" on the front cover. The Seeing Stone is actually set in the Welsh Marches in 1199 so you are instantly aware that we're not really talking about that Arthur because everyone knows he was supposed to have been born in the 5th century (thanks Wikipedia) I was completely clueless beyond the stock knowledge of myth and legend about Merlin, swords in stones, ladies in lakes, Camelot, Guinevere and Avalon. Young Arthur de Caldicot discovers his namesake the boy King Arthur in his obsidian seeing stone given to him by Merlin. Merlin? I learn so much writing this blog because I do try and check facts so now I know all there is to know about Wizard Number One. Thus the stage is set for Kevin (sorry first name terms...getting fed up typing all that) to weave in the old legends with life in a community in the Middle Ages and like Philip I was spellbound. 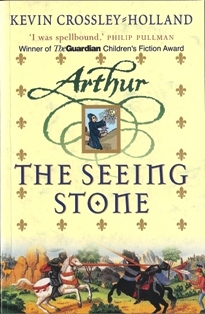 Young Arthur's life mirrors the life of Arthur-in-the Stone's in a bit of a doppelganger sort of way and he finds himself living in two worlds.The end result is an intricately woven seamless whole of 100 chapters creating an atmosphere and a world you can't bear to leave. So involved was I that had we been having roast swan for tea instead of pizza I would have been briefly delighted. I'm already well into the next in the trilogy, have the third lined up and also the recent sequel Gatty's Tale. 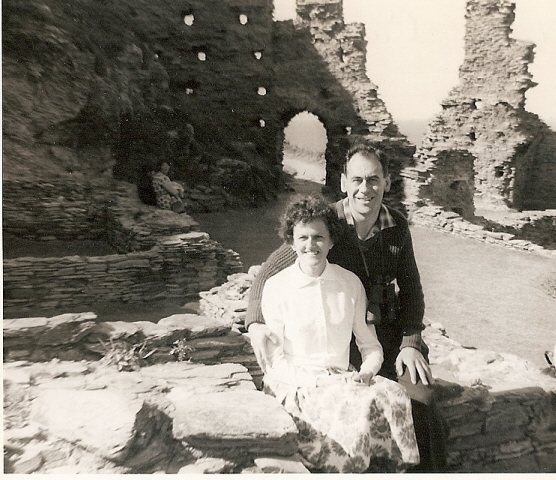 "King Arthur's Castle Tintagel 1963, King Arthur and Guinevere in foreground".